By Gabrielle. Photos by Charlotte Smith Beck, from my Mother’s 70th Birthday Party in Mendon, Utah. Have you ever been given an especially thoughtful gift? It’s the sort of pleasure that keeps on giving. My sister Rachel gave me one of these kites (the kites in the photos on this post) last August, and I just grin every time I see it. She actually gave one to each of my siblings as well. And as you might guess, there’s a story behind them. Growing up, my parents had a kite like these pictured, with a dragon face, and colored panels making a rainbow of the tail. 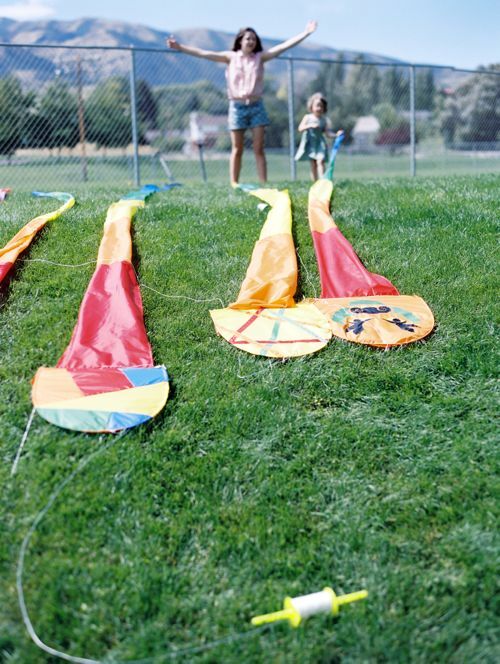 We called it the Dragon Kite, and it was well-loved. 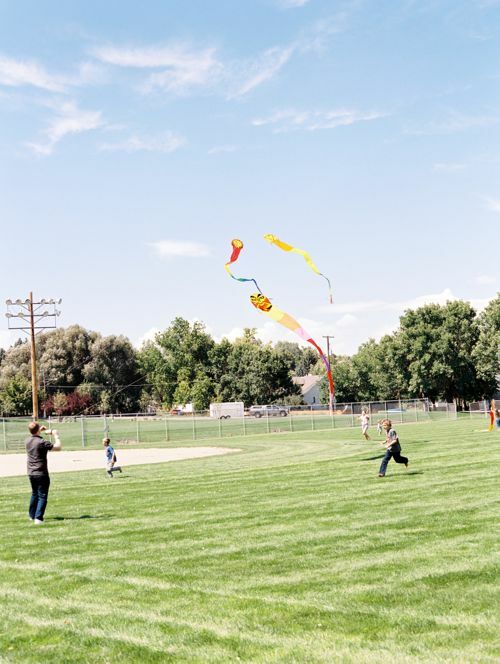 My father grew up in the Bay Area and my parents had picked up the dragon kite at a San Francisco kite shop (there’s so much good kite-flying weather here, that there are whole shops dedicated just to kites). 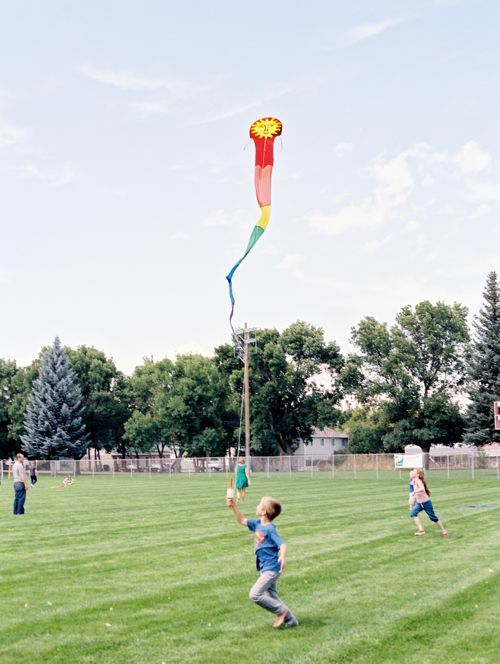 The thing about this kite is that as a kid, it was even fun on a non-windy day. Just running with it made the loooong tail fly behind. One kid would run with the kite and the other kids would chase it and try to catch the tail. When I was older, it was great to entertain younger kids on babysitting jobs. And it was good for actual kite-flying too. We’d take it to Lake Powell every summer and fly it off the top of the house boat. And then one summer, it caught on something, or got caught by a gust of wind, or I don’t even quite remember. But the kite was lost somewhere over the lake. This was a sad day. We loved that kite. Then, on the day Ben Blair and I married, we received our own dragon kite! A gift from my Aunt Robin & Uncle Mark. They knew about my parent’s dragon kite, and they lived in Northern California and could get to the kite shop. (Remember, this was pre-internet when it was hard to find things.) What a great wedding gift. My eyes absolutely lit up when we opened it. Ben and I loved that kite! Though we called it the dragon kite, ours didn’t have a dragon face. It had an arched rainbow and clouds, with the same rainbow tale as the dragon kite I grew up with. And my kids loved the kite too. During our New York years, we kept in the car so it was at the ready anytime we stopped at a park. But one fall day we were flying it over the Hudson River at a park called Rockwood Hall, and all of sudden, it was gone in a gust of wind. Another sad day. When we moved to Oakland, we thought: Let’s buy a dragon kite! But we looked and looked and did some research and they’re no longer in production. Turns out, my sister Rachel was doing the same kind of hunting. She wanted a dragon kite for her family as well. And she found out the same thing we did. They’re no longer available. Sad face. So you know what she did? She made her own! A dragon kite for her own family, and a dragon kits for each of her brothers and sisters. Every one with a different design. Then, when we were all gathered last August to celebrate my mother’s 70th birthday, she surprised us with them. 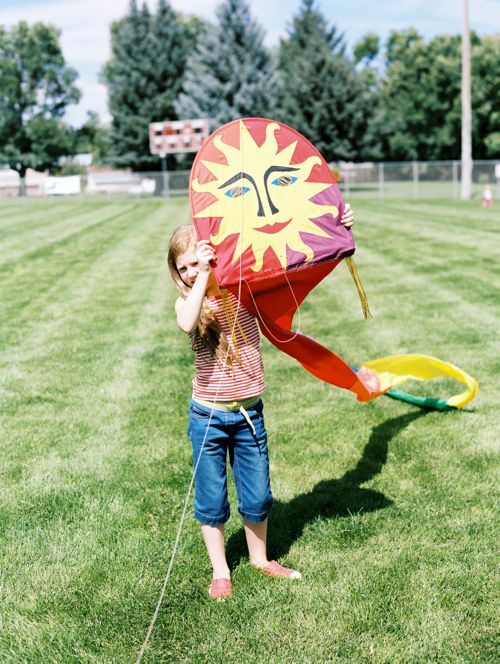 The other day, I finally downloaded images from the party, and the kite pictures made me so happy! I couldn’t wait to share with you. For those of you who are in the middle of winter snow drifts, I hope these sunny photos warm you. Now back to the question of thoughtful gifts. Have you ever been given something super thoughtful like that? Or maybe you gave something that was particularly awesome? Have you ever lost an object you loved — even one that wasn’t considered expensive or lavish? I’d love to hear! There is nothing better than opening a gift and realizing the giver really thought about you and chose a gift that would mean something to you. You hold on to that feeling forever (even if the gift floats away into the sky). 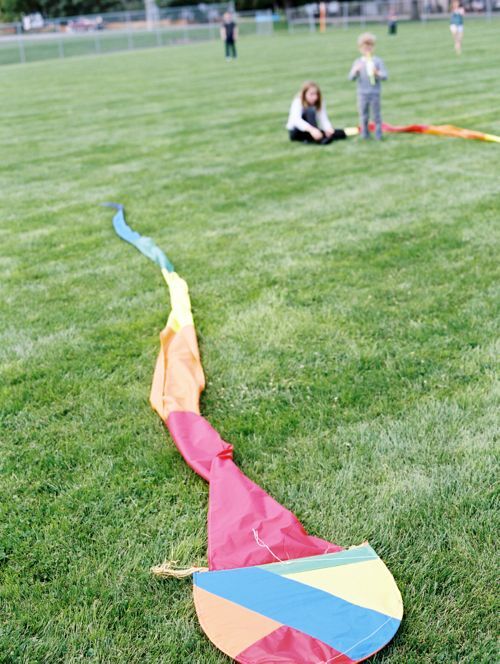 We love flying kites and have an old-style dragon kite, among others. I can’t believe they’re not available any more! 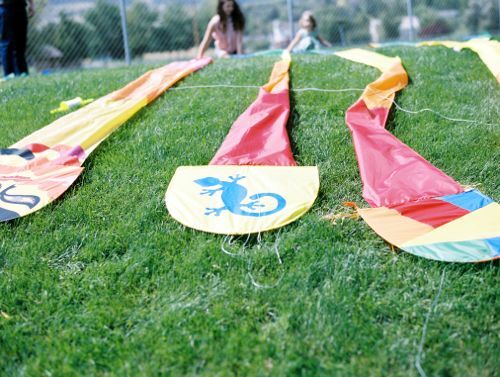 Make sure to check out the Berkeley Kite Festival in July. It’s amazing! My kids made a StoryLines book for my mom at Christmas called My Grandma is a Super Hero. The best part was how the four of them, aged 5 to 10, all worked on it together, without fighting, for 3 days. It turned out beautifully, and she really loves it. It was an easy low cost project that was a great present to give and receive. Finally watched Saving Mr. Banks (why did I wait so long? Didn’t think it’d be so good?) 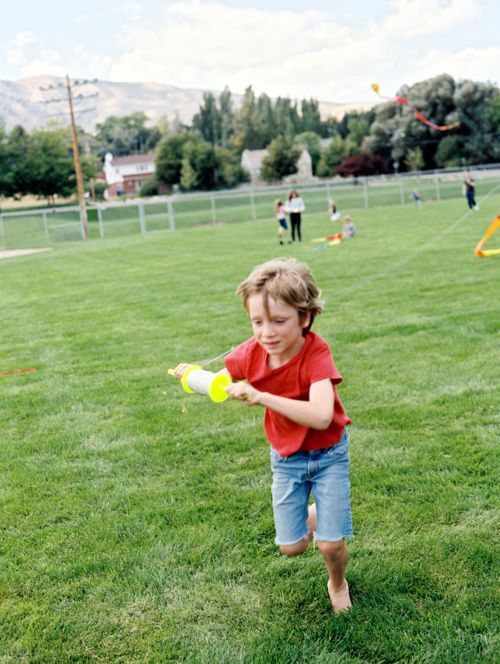 and haven’t been able to get “Let’s Go Fly a Kite” out of my mind since! Husband flies his kite(s) off a fishing pole, now I am remembering. Also, at the beach (or wherever I suppose), you can string up a bikini top or tiny t-shirt (should it strike your fancy) and up it goes floating into mid-air behind one’s kite. I lived in Sweden in college and we went to the town market every Saturday. I was always eyeing up a pair of white mittens that are probably just for tourists but sold as a traditional Swedish pair with red, yellow, and blue yarn around the cuff. I finally bought a pair before moving home. Flash forward to a 21st birthday party and one went missing. I was so upset. But then a friend from Sweden heard and sent me a new pair! I was so excited to have them again. Flash forward to a new puppy who ate one. I was down my favorite pair of mittens once again. But then a friend went to visit her brother in Sweden and got me a new pair! I’m happy to say I’ve had those for years, and now my dilemma is just how to sew up a whole that is forming. Even with something as ridiculous as a special pair of mittens, it’s nice to have friends that care enough to get them from another country! I love this story! You have thoughtful friends, Christine :-). I am so inspired by the dragon kite story. What an amazingly thoughtful gift your sister, Rachel, gave to each of you. 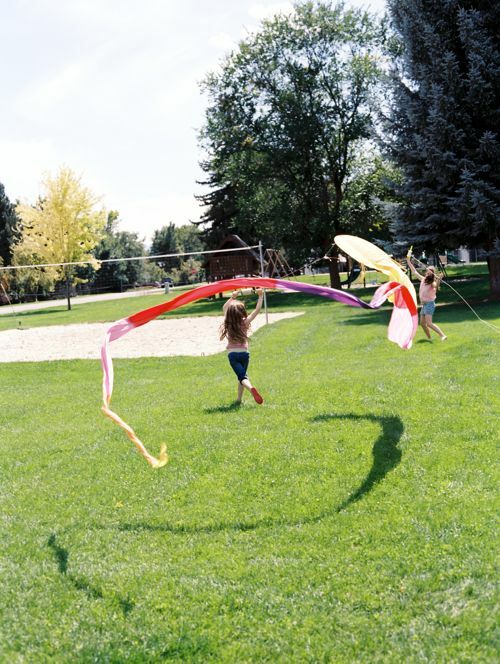 The whole idea of family and fun and festival and flying kites is thrilling and liberating! And Rachel designing and making them all is incredible. I want to fly a dragon kite!! I am inspired by the actions of your family members – honoring traditions of your dad and mom growing up, the thoughtfulness of your sister and the effort involved . I wish I was a better writer, so I could adequately express what this speaks to me. I love this! What a thoughtful gift. I have good memories of kite flying too, and one of my favorite pictures of my daughter is her chasing after a kite at the beach. I had a dragon kite. It wasn’t as cool as this one! Now we have a cube kite. It is super easy and compact. We take it on every beach vacation. When I was little, my bedroom was across the hall from my dad’s home office. When I was scared at night, he would leave both our doors open a crack, and I was enormously comforted by seeing the sliver of light from his office, where I knew he was working, and ever close by. He passed away when I was 13 and our family moved out of that house 7 years later. One Christmas after I was married, my older brother surprised me with a framed picture of my dad’s office door, open just a crack, and with light streaming out of it. I instantly crumpled into a sobbing mess. It was one of the most thoughtful gifts I have ever received. That is the sweetest! It honestly made me tear up at such a thoughtful gift. I would have a sobbing mess too! Wow. Me too. What a gift! Wow, Julia, this is one of the most thoughtful gifts I have ever heard about! Absolutely amazing. I was in tears as well. Love all the details behind this lovely gift. Such a thoughtful and heart-warming gift! Great that all the cousins now get to enjoy something that meant a lot to your family when you were growing up! My husband and I first dated the summer before he went off to college. Our first date was a drive into L.A. and see a foreign movie! We went our separate ways in the Fall, but married 27 years later. For our 3rd wedding anniversary, he tracked down a copy of the film from our first date on DVD, and wrapped in paper he made from photos of us at 18 years old. It was so special to me! He’s a keeper!! Ah, I was hoping you could tell me where to get one . . . I had one of those as a child that my mom brought me after a trip to San Francisco. I’d love to have another. Mine got ripped. If you ever come across them I hope you post it. How fun! I grew up in Cache Valley and these pictures make me homesick. Also, your photographer, Charlotte, is married to my uncle. We love her! Many years ago, with three little boys filling my days, my husband got me a beautiful silver necklace and matching earrings for Christmas. I decided to wear them to town on my weekly shopping trip, (not my usual T-shirt and Jeans look). I felt so special wearing them. When I got home, and went to take them off to put them away, I saw the necklace had fallen off. I went all the way back to town and searched the grocery store, asked at the lost and found, and the necklace was nowhere to be found. I felt terrible knowing this had set Mike back significantly, and especially that he is such a thoughtful gift giver. I can hardly wear the earrings 30 years later, without feeling that loss. It’s not the last piece of jewelry given to me that has fallen off either. I have a very hard time keeping earrings and necklaces in place. Don’t know why, but it does always make me feel bad. I wonder if other people have that same problem? Reading your post, I could envision the kites you were speaking of, and knew I had seen them somewhere. I remembered a kite shop in Boulder, Colorado, at the Pearl Street pedestrian mall. I did a quick google search, and they do have dragon kites for sale! You can find their website at intothewind.com.